The TrafficTicket™ generates unheard of response rates and real traffic to your business. Normal response rates for direct mail are in the 1% to 2% range and thus can be very expensive on a per lead basis, the Traffic ticket™ program provides results 15 to 20 times better than that; dramatically reducing your cost per lead while providing a far greater number of leads than most businesses are accustomed to. Check out some of these details and case studies. Discounts and promotional allowances used repeatedly become ‘part of the price’, and appeal is lost. Hence, why many automobile companies have gone to a everyday price versus discounts or rebates. A true incentive provides not only an inducement, but adds excitement, interest, drama and a sense of urgency.Discounts often mean ‘giving away’ the product and ‘doing this a new way’ each time develops into a vicious cycle. If cash/rebates/free goods/discounts are such a great motivators, why aren’t they selling more or buying more? Objective: Bremer just acquired many First Star banks. They wanted to welcome First Star Customers to Bremer and retain them. 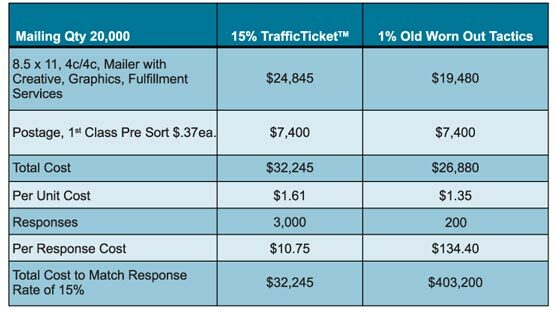 Results: They mailed over 80,000 Traffic Tickets™ and had a 20% response rate. All production goals were exceeded and retention was almost 99%! 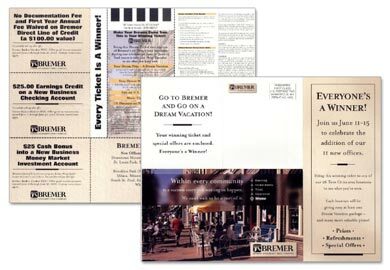 This was the third success story Bremer had using the TrafficTicket. 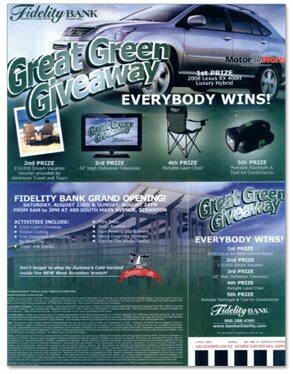 Strategy: Use a direct mail campaign consisting of a game card (Traffic Tickets™) and a display on site for the game cards. Traffic Tickets™ were mailed to 800,000 households surrounding 300 branches. Results: Client was expecting a 2% response which was 16,000 people. 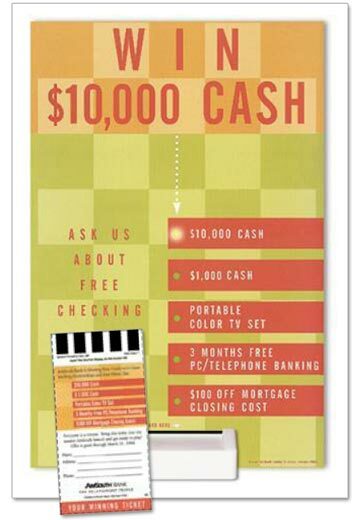 This promotion actually drove 178,500 customers to the branches. The program resulted in high conversion rates and this bank set a new record for most new accounts opened during any 6-week promotional period! Objective: Wells Fargo built a new financial facility in a medium size town in Iowa. They needed a tactic to bring in customers to this new facility during the grand opening event. Results: They distributed the mailer style ticket to residence in the town and received over 20% redemption where the customer had to bring The TrafficTickets™ into the bank and talk to a customer service person and then they would decode the ticket and see what they won. Their goal for increased new accounts exceeded all expectations and they felt that the one on one 5 minute contact with the customer was invaluable to relationship building. Results: The bank received over 4000 new and potential customers over a 4 week period -18% response rate!